On a peninsula 80km south of Adelaide is the holiday town of Victor Harbor. A place that attracts whales, seals and penguins as well as tourists. Victor Harbor is a pretty place that was built up around whaling and sealing back in the late 1830s. Thankfully, whaling has been outlawed in this part of the world long since then. The town feels different from the rest of the mainland - tourist venues aside, there is a sense of remoteness as if it were on a separate island. 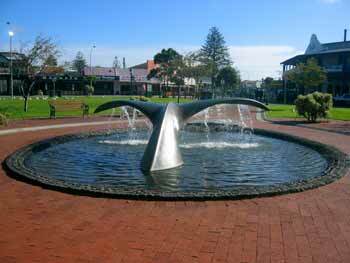 Whale-shaped fountain in Victor Harbor. Keen to find out more about whales and whether any had been spotted recently, we went over to the Whale Centre. We were told that the last sighting took place last week. By this time of year, there should be more southern right whales on the migratory path but perhaps due to weather and rough seas, not many have made an appearance at Victor Harbor. We'll just have to sit tight and wait for a bit. Granite Island is a small island that is connected to the mainland by a causeway. It takes about 15 minutes to walk across or alternatively, you could take the horse-drawn tram. We went for the latter option first as it was something different to try. I felt a bit guilty halfway through as there were a fair few of us on the tram and I wondered how Bill (our horse) was coping down there. He didn't look uncomfortable or like he was straining with difficulty. I guess once the momentum had been built up, it wasn't too bad. Still, we decided to walk back on our return journey! 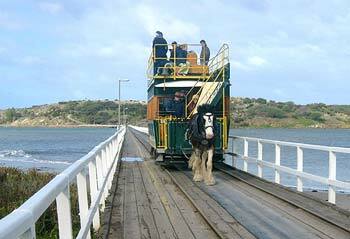 The horse tram from Victor Harbor to Granite Island. We followed the boardwalk up to the top of Granite Island and admired the views. Granite Island is basically as the name suggests and we could see granite boulders dotted around everywhere. We spotted a group of three tourists sat precariously on some rocks watching the waves crashing just below them. "They'll be swept off if three waves come in one after another," came the voice of a man with a Scottish accent. I looked at him and nodded, "Yes, the waves look pretty strong down there." "It's happened before - tourists being swept off those rocks," came the voice of another familiar sounding accent. Despite the regional British accents, the couple were locals (since 1970) and told us about their whale sightings close to shore (alas, not today). The clear blue skies meant that we could see The Bluff (a highpoint overlooking Encounter Bay) and a few smaller islands in the distance. Later, once back on the mainland, we drove over to The Bluff and did the same thing, looking back over the bay to where we'd been just an hour previously - just making sure we get it covered from all angles! In the evening, we wrapped up warm and headed back over to Granite Island, also a rookery to the 2000 resident penguins. 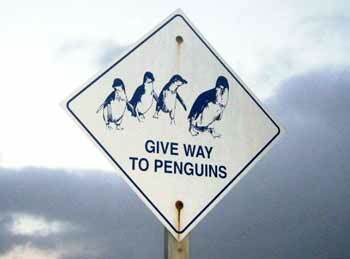 We joined a tour and were taken to the penguin hot-spots. We watched the penguins come up from a day of fishing - they swim as far as 25km out to sea and come back to feed their young and rest. They are very active and only sleep for 4 minutes at a time. Before they know it, their day starts all over again and they go back into the sea again before the sun rises. And I thought we had busy lives! We saw lots of penguins dotted around including some chicks and a group of five penguins scaling up steep rocks coming up from the sea. The tour guide giggled as she shone her red-beamed torch (the red filter is kinder to their eyes) at an amorous couple, joking "and here's the red light district. It is the mating season after all!" Who's boss here? The penguins, that's who! We spotted possums too but were told that they do not attack the penguins. They do, however, steal their eggs. I read somewhere that there was also a seal colony here and asked our guide whether she has seen any penguins being eaten by the seals. "Yes, it's horrible," she winced, "but I guess it's part of the food chain. Not much we can do about it. One time, I saw this seal propel a penguin high up into the air, the penguin landed on the water and swam off. The seals play with them like this - it's the only way the little birds ever get to fly!" It was a good tour and we learned a lot about these amazing birds. We stayed behind for a bit longer after the official tour finished and listened to the croaking noises the penguins made - they are a rowdy bunch!